Veronica and I have long wanted a garden and now that we own a house we have one. Building a garden box, putting in some dirt and planting seeds is pretty easy, but actually growing fruit and vegetables that can be consumed turned out to be a little bit more difficult than we thought it would be. 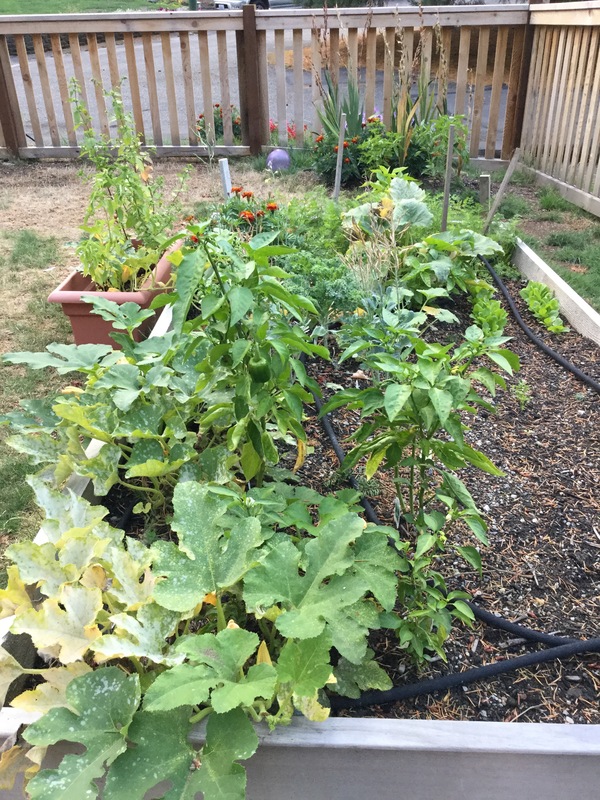 The soaker hose has been a Godsend to our garden’s growth in the late summer months. But since this is our first attempt we’re not too worried. Play around with some different ideas this year and then go big next spring. About a month ago we pulled a carrot and much to our chagrin, it was pretty pitiful. In fact, none of our plants were growing all that well – except for the peas of course. Our carrots are finally starting to pay off. We almost have more than we know what to do with. We have suffered through a major drought this summer, but I had been watering every day. Turns out, though, that watering for 15 minutes once a day with a wand on the end of a garden hose is not good enough for most plants. With that in mind, I headed down to Lowe’s and bought a soaker hose and a timer. Man, I had no idea what I was missing. I’m actually pretty embarrassed about my watering technique the rest of the summer as I wasted prime growing months by not watering properly. Anyway, ever since I put the soaker hose down in the garden and let it do its thing for an hour every other day, all of my plants have grown like weeds. 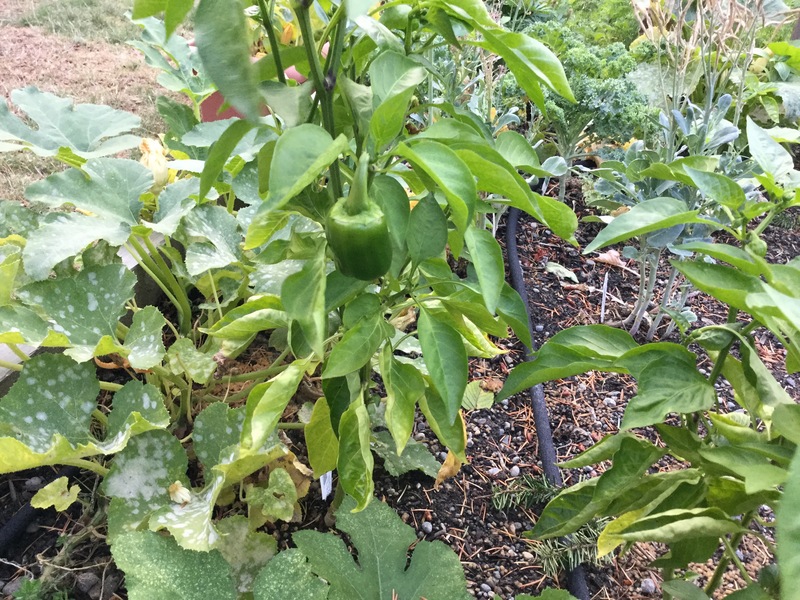 It seems rather late in the season for a green pepper to be growing, but I’m not going to complain. One one hand, our garden is finally producing vegetables that Veronica has used to make soups and salads among other things. On the other hand, we are also dealing with some late season issues including slugs and a fungus issue on our plants. 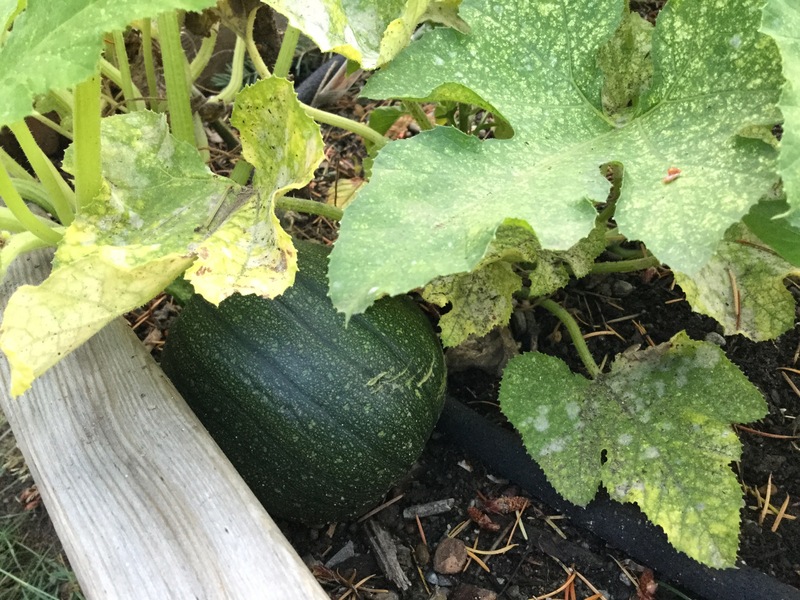 We’ve produced a zucchini. 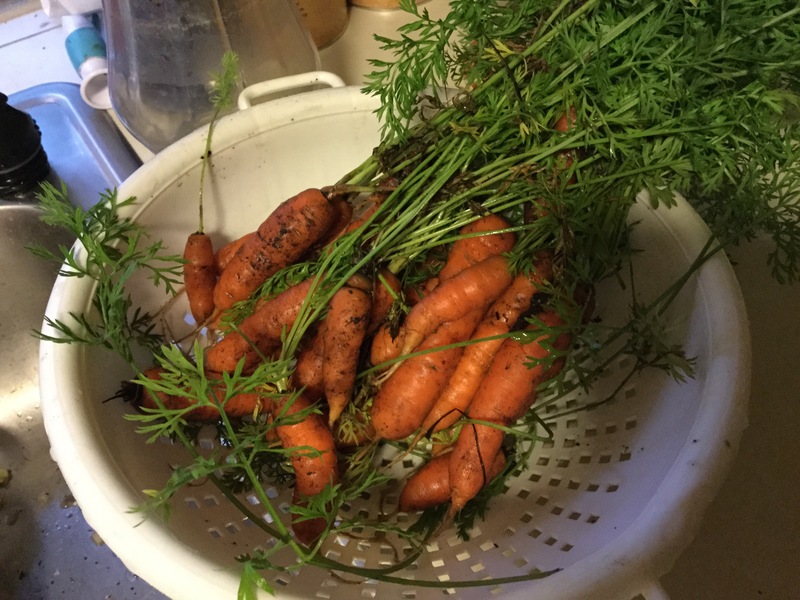 I know that is pretty pitiful – and if you’ve seen my brother and his wife’s garden, you’d be even more embarrassed – but it was a nice reward to our novice attempt at producing food this summer. Our pumpkin plants are growing like crazy and we have three softball sized pumpkins doing their thing. Hopefully they keep growing so we can carve them in October. Here come our pumpkins! They are about softball size at this point. The tomatoes are also starting to come in bunches and have been rather tasty. They aren’t as crisp as store bought ones, but I don’t know if that is because it is the type of tomatoes we planted or if we need to pick them earlier/later to achieve that crispness. Either way, they are good. We also have had a nice crop of carrots, which we didn’t know if we would attain. 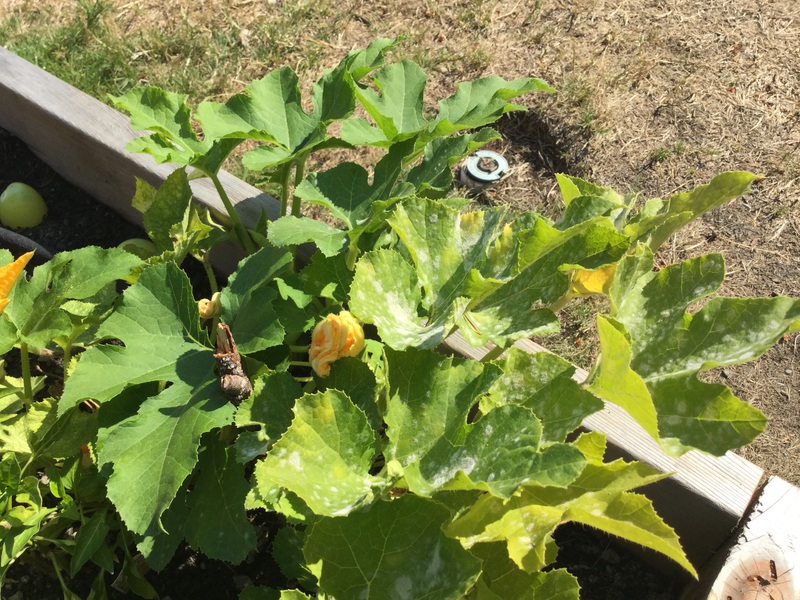 The white spots on the leaves is the powdery mildew that has hammered our pumpkins pretty hard. With the additional water and growing plants we attracted slugs. I tried a few natural remedies like a bowl of beer (didn’t work and I was scared my daughter would get into it) and spreading salt around my plants before giving up and buying a jug of sluggo, which my local store told me is safe to use in gardens. Since applying that to the area, I have seen no slugs. I was hoping to avoid using anything like sluggo this summer, and so far I haven’t used any fertilizer or anything like that. But sometimes you have to bring out the heavy artillery on the critters. About the same time the slugs showed up we started noticing white spots on our pumpkin plant leaves, which soon spread to our zucchinis and what was left of our cucumbers. The spots would spread and eventually kill the leaves and any fruit growing in that area. The disease is called Powdery Mildew and comes about from water getting on the leaves, or the leaves not being able to dry out properly because there are too many plants in a confined area. I will admit that I planted a jillion things this summer and failed to thin them out. Then I doubled down and added marigolds which have been growing like crazy, so this was definitely self-inflicted. I’ve been trying a natural remedy of one-part milk and one-part water, spraying it on the leaves in the morning. I haven’t noticed much difference, frankly. The next solution is to start clearing plants out to try and give them some breathing room. 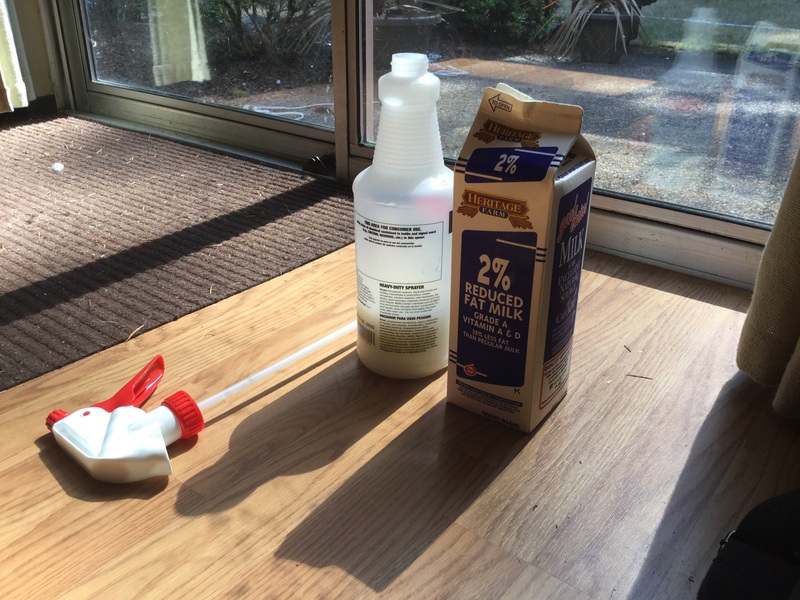 We read online that mixing one part water with one part 2 percent milk and spraying it on the damaged leaves will cure your plants of Powdery Mildew. Whether that works remains to be seen. Next up is our attempt at winter gardening. We planted spinach, lettuce and more carrots at the end of July and they are starting to come up right now. We’re also hoping to do some winter crops and then it is just the preparation for next spring.